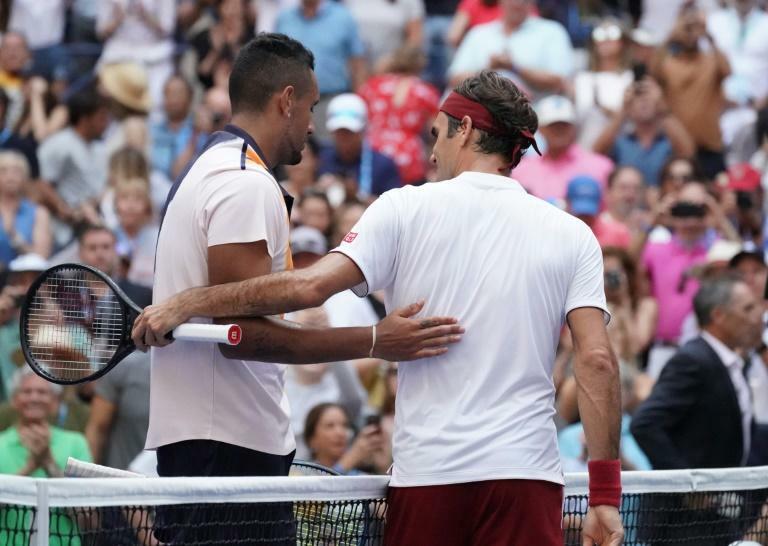 Five-time champion Roger Federer found a new way to amaze Saturday as he reached the US Open last 16 with a 6-4, 6-1, 7-5 victory over Nick Kyrgios. The second-seeded Swiss withstood an early onslaught from the unpredictable Aussie, firing 51 winners that included an unlikely forehand flicked around the net post that Kyrgios couldn't believe. "Definitely a bit of luck and good feet," Federer said of the shot that had Kyrgios wide-eyed at the net. 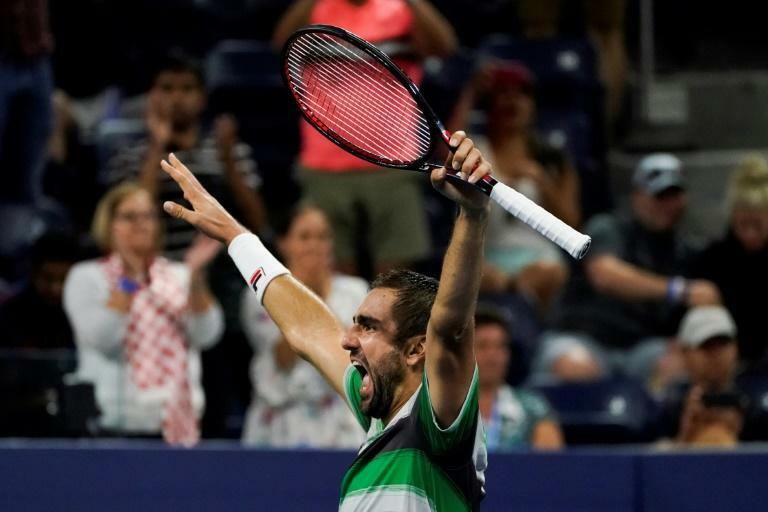 The wonder shot was the talk of the day -- but the night belonged to 2014 champion Marin Cilic and 19-year-old Australian Alex de Minaur, who battled for four hours on Louis Armstrong Stadium before Cilic pulled off a 4-6, 3-6, 6-3, 6-4, 7-5 victory. "Incredible fighting spirit," Cilic said of de Minaur after the young Aussie kept him on court until 2.22 am (0622 GMT) Sunday morning -- the second-latest finish in US Open history. "This is a moment to remember," added Cilic, who booked a fourth-round meeting with Belgian David Goffin. Federer will take on Australian John Millman, who reached the last 16 of a major for the first time with a 6-4, 4-6, 6-1, 6-3 victory over Kazakhstan's Mikhail Kukushkin. "It was the best match of the week so far without a doubt, and one of the best performances of the hardcourt season after Wimbledon," said Djokovic, who warmed up for Flushing Meadows by beating Federer in the Cincinnati Masters final. Djokovic saved all five break points he faced to book a meeting with Joao Sousa of Portugal, a 7-6 (7/5), 4-6, 7-6 (7/4), 7-6 (7/5) winner over France's Lucas Pouille. The third round was the end of the line for men's and women's fourth seeds from Germany -- Alexander Zverev and Angelique Kerber. Kerber, the 2016 US Open winner tying to become the third woman in the last 20 years to win both Wimbledon and the US Open in the same season, was bundled out by Slovakia's Dominika Cibulkova 3-6, 6-3, 6-3. Kohlschreiber will seek a quarter-final berth against 2014 runner-up Kei Nishikori after the Japanese downed Argentine Diego Schwartzman 6-4, 6-4, 5-7, 6-1. Kerber's defeat followed the early exits of world number one Simona Halep and No. 2 Caroline Wozniacki -- who were both also seeking a second Grand Slam title of the year. Fifth seed Petra Kvitova was also ousted, the two-time Wimbledon champion falling 7-5, 6-1 to rising Belarussian star Aryna Sabalenka. In all just three of the top 10 women made it through to the fourth round, although Kerber didn't blame a domino effect for her departure. "I'm not looking around who was winning or who was losing," she said. "You have sometimes days where you are trying everything, but it's not really working as you wish." Sixth-seeded Caroline Garcia of France also departed, beaten 5-7, 6-4, 7-6 (7/4) by Spain's Carla Suarez Navarro, and Czech teenager Marketa Vondrousova sprang a surprise, too, with a 7-6 (7/4), 2-6, 7-6 (7/1) victory over 13th-seeded Belgian Kiki Bertens. Vondrousova, through to a Grand Slam third round for the first time, will play Ukraine's Lesia Tsurenko, who defeated Czech Katerina Siniakova 6-4, 6-0 after taking out Wozniacki in the second round.